In all their bonnets blue. WHEN we reflect upon the many unique characteristics of the Heather—its stern beauty of delicate purple bells nestling to a green-mantled burly growth of brushwood; its distinctive vitality and strength of endurance; the wild, rugged solitude of its native home in the Scottish Highlands, and the nntamed spirit of independence which over-broods this hermit flower of the mountain crags—it is not to be wondered at that the Heather should have been adopted as a symbol, or badge, by several of the leading clans of Scotland. Indeed, in olden times such badges were superstitiously regarded, and the clans adopting specific subjects as their symbols were supposed to be descended from these subjects. And who more proud of their ancestors than the descendants of the Heather! The origin of the selection of certain plants as clan badges appears to be shrouded in mystery, and mythology aids us but little in our research looking to the discovery of the inception of the custom. 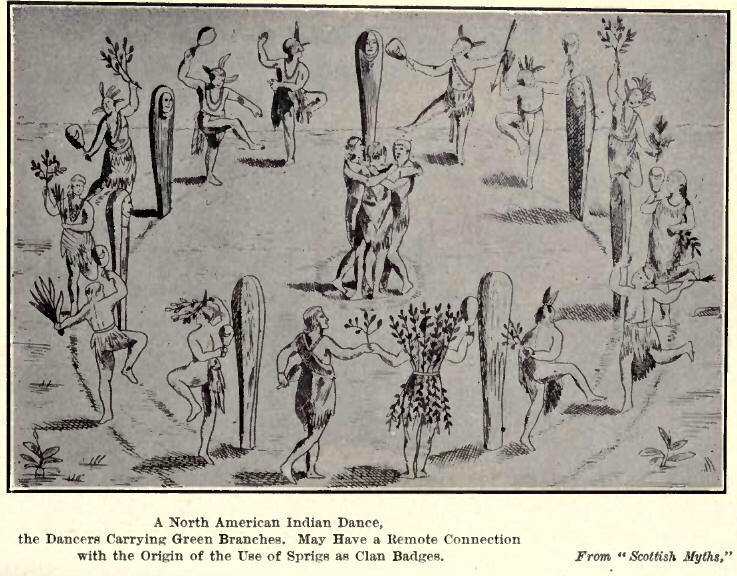 Speaking of the Cativellauni, with which he says the Scots were identified, Dr. R. C. Maclagan, in "Scottish Myths" (1882), says: ".Now what the peculiar ceremonies were which characterized this people, it is not easy to say, but it is curious to find among the natives of North America, as figured by Lafitau in his Mceurs des Sauvages Ameriquains, published in 1724, a dance which seems perhaps to point to what may have taken place among our ancestors. I annex a rough copy of the plate. 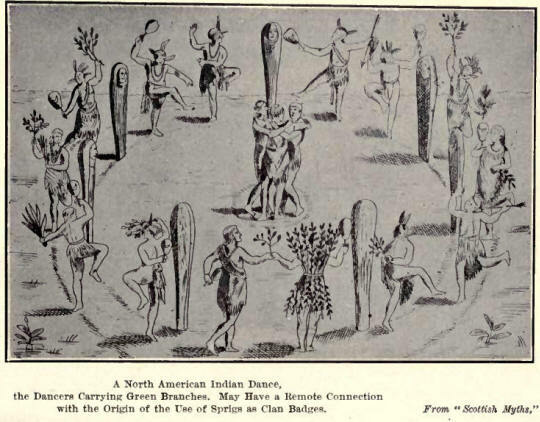 Here we have a barbarous people dancing what might be a 'reel,' in a circle peculiarly like our stone circles. The total number of performers is eight couple and an odd man. This makes it, possibly, a sheer coincidence, much like an 'eightsome' reel, and, as in this latter, there is what is called a 'prisoner,' so here we have the center occupied by three of the performers, who may be performing what is allied to the 'jig,' a dance of three performers. The green branches which they carry, and with which one at least is dressed (? ), make them Vecturiones, while if the belief that the bladder-shaped, crescent-ornamented things carried by some of the performers are inflated bladders or skins, used perhaps for causing sound, the bearers might be called Firbolg. The Americans figured may have been less advanced in the arts than the Cativellauni, but if the dance is a 'reel,' and was such as the Maiatai (Scots) danced, it still survives after seventeen centuries. 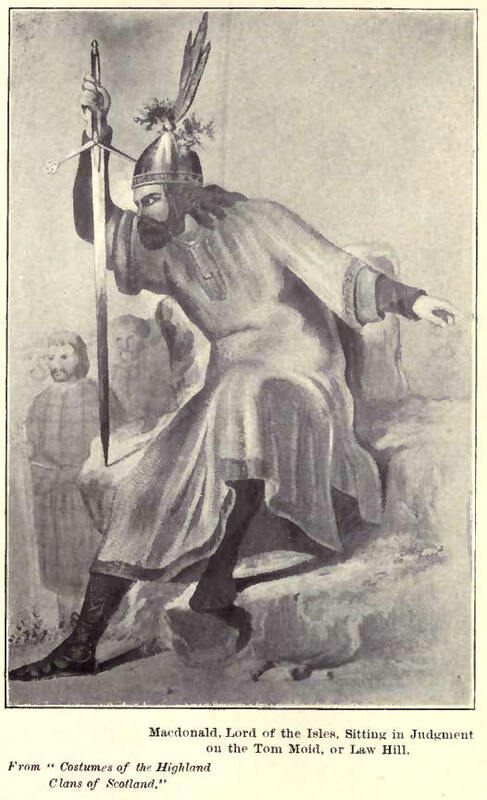 "Is it not possible that the sprigs carried as clan badges may hint at another survival, while its effect in tradition is clear in the story in which Macbeth is described as defeated by the followers of Malcolm (the servant of the dove) when they carried green boughs of the 'Byrnnane' wood to 'Dunsynanc,' the hill of charms or enchantment?" It is, however, more reasonable to infer that the custom had its origin in the practice of the primitive inhabitants of Scotland, of painting or dyeing their skins either with vegetable or mineral colors, depicting various figures of animals, shells, flowers, fishes, plants, birds, etc. It is recorded that the Highlanders of Druidal times always fought stripped to the kilt; and that they painted their crests on their bosoms, so that they might be recognized and distinguished in the conflict, as well as among the slain should that be their fate. As a sequence of civilization, would result the transition from this barbaric portraiture to the adoption of the natural object. Consequently we are also told that it was a custom of the clans to enter into battle each one bearing its own significant twig. General Stewart, in his "Highlanders," says: "These marks of distinction were composed of a tuft of heath, pine or such plant as would not fade or cast the leaf. Thus the Macdonalds wore in their bonnets tufts of heath; the Macgregors and Grants a bunch of pine; the Drummonds and Mackenzies wore the holly—the former the plain, the latter the variegated; the Macintoshes the boxwood, and so on; always taking care, whatever the badge was, that it should be permanent and not affected by the change of season, and thus be equally conspicuous in winter as in summer. This was the practice of all except the Stewarts, who generally wore the oak; which from Losing the leaf and decaying, many regarded as ominous of the decline of the family and name, who also considered the oak emblematical, as the leaves, though withered and decayed, still hang by the branches till forced off by the new leaves in spring." It appears, however, that the Heather badge was not at all times displayed in the bonnet; indeed, a bonnet was more often than not wanting in the garb of the fighting clansman. A letter in the Wodrow MS. in the Advocates' Library, dated February i, 1678, gives an account of the Highland host, which was brought down to curb the Covenanters, and we find "among the ensigns, besides other singularities, the Glencoe men were verie remarkable, who had for their ensigne a faire bush of heath, well spread and displayed on the head of a staff, such as might have affrighted a Roman Eagle." As has been stated, the Heather, Fraoch gorm, is the badge of the Clan Macdonald; it is also that of the Macdonalds of Clanronald, of Keppoch, and Glengarry; and Fraoch-eilean, "heathy isle," is their slogan or war cry. The Heather is likewise the badge of Clans Macalister, Macintyre and Macnab. And the following clans wear Heather with another badge or badges: Duncan, or Robertson, Heather, Bracken; Lamont, Crab-tree, Heather; Macdougall, Heather, Pine, or Cypress; Macfarlane, Heather, Cranberry, Cloudberry; Maclaughlan, Heather, Rowan, Periwinkle; Macneil, Heather, Sea-ware, Trefoil, Dryas; Macnaughton, Heather, Trailing Azalea; Macpherson, Heather, Box, or Red Whortleberry. The custom of wearing sprigs as badges seems to have fallen into desuetude for a time. Phillips, in his "Floral Emblems," says it was revived when His Majesty visited his northern capital in the year 1822. "His loyal Scottish subjects on that joyful event paid their homage to their sovereign at the Palace of Holy-rood, each wearing the heraldic emblem of his clan." He then gives a list of the clan badges represented there. Pibroch of Donuil Dhu Knell for the onset. The Lowlanders had good cause to become familiar with those various badges; and a story is narrated, telling of a ruse by which Prince Charles Edward once hoped to impose upon the citizens of Glasgow, but which was defeated by means of that knowledge. He led several parties of Highlanders through the Trongate, made them pass down a bystreet, and, after a short detour, return through the Trongate, apparently a new reinforcement. But the pine and the Heather were only too well known to be mistaken by the sharp eyes of the citizens of St. Mungo, who did not find it necessary to leave the Saut Market to know a Macdonald from a Campbell. Says a writer in Cornhill: "It is a matter of wonder why the thistle, with its defiant motto, has been adopted as the emblem of Scotland, rather than the Heather, which so regally mantles its hills. The rigid angularities of the national character live indeed in one; but the tender grace, the breadth of color, the fragility and yet the endurance of the Heather, point to the higher and finer aspects of the Scotch nature, and the deep affection and strength of will which underlie it. The fact seems to be that until the Union, the aggressive, prickly nature of the thistle naturally too aptly symbolized the rough and warlike disposition of Scotland. Few sentiments save patriotism found favor with its people before the middle of the eighteenth century. They took no thought of poetry or the refinements of life when the sword was at their throats and their ears rang with denunciation of Stuart or Hanoverian. When this question was definitely settled, and commerce took her place in peace upon her throne, border feud and national animosity alike faded into the emotional love of country and home, which finds its expression in so many beautiful ballads and songs, the slogan being exchanged for those pathetic love songs which are the glory of Scotch literature. The Heather was twisted in many a chaplet of song." Despite the hold that the Heather has upon every Scottish heart, it does not seem probable that it will ever supplant the thistle as the national emblem of Scotland. The Heather was, however, chosen by the Pan-Celtic Congress at its meeting in Glasgow in 1901, as a symbolic flower, which all claiming to be of Celtic descent could agree upon as their emblem.